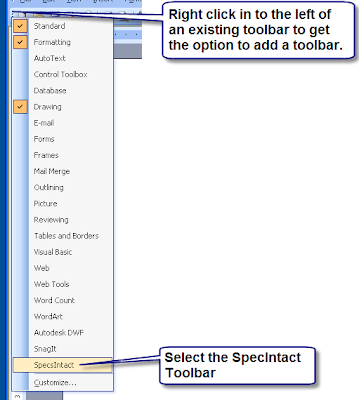 First load the toolbar from the SpecsIntact.dot (a Microsoft Windows template file). To do this go to the menu bar and choose Tools>Templates and Add-ins. I would place place the cursor with in the text you want the text tags added to and press the Text toolbar item to place the tags. The program will had the correct tag to the beginning and end of the paragraph. Once you have gone through and added all of the tags copy the entire document and add it to a blank SpecsIntact file. 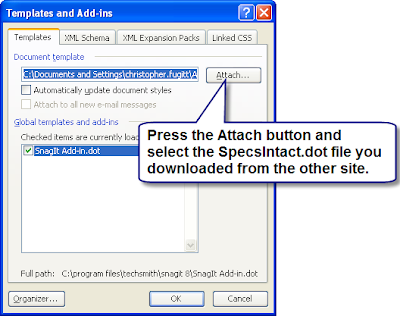 You may want to create a new SpecsIntact file and paste within the document type tags.